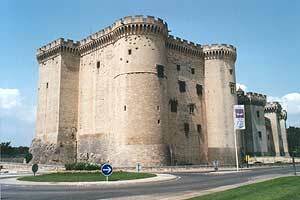 Drawn up at the edge of the Rhone, the castle of Tarascon defended the access of the possessions of the counts de Provence. Including/understanding a farmyard preceding the castle itself, the new building, built by Louis II of Anjou since 1400 and finished one half-century afterwards by king Rene, as much the palate as of the fortress with its high naked and almost blind walls holds dissimulating the refined decoration of the home seigneurial and the central court. Prison as from the XVIIIe century, bought by the State in 1926, the castle shelters the exceptional continuation of tapestries of the XVIIe century, acquired by the national Case of the Historic buildings and the Sites, recalling "the history of Scipion". The castle is closed on January 1, May 1, 1st and November 11, December 25.